The standard for showing brown poodles states that they are to have dark amber eyes and dark liver noses, lips, eye rims and toenails. There’s no way to be objective, though, when describing the beauty of their rich, deep, chocolate color. Even photos don’t truly do them justice, as you’ll realize when you see them for yourself. One thing to keep in mind, however, is that brown poodles do tend to go prematurely gray. There are some who think that brown poodles tend to be more active and energetic–more “doggy” than those of other colors. Most breeders agree, however, that there is little connection between personality and coat color. In fact, a poodle’s personality has more to do with how it has been raised. If you get your poodle from a kennel-type source, chances are he or she will have behavioral problems. 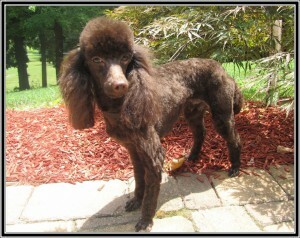 Any puppy from Homestead Poodles, however, will come to you completely socialized. We raise our puppies in our home, from the moment they are born until they go to their new families. They are used to being around other dogs, cats and children, so they won’t have problems adjusting. Once you take your precious poodle home with you, you only have to help him or her adjust to your home life. A big part of that adjustment is housebreaking. There is one error that is very easy for owners of toy poodles to make when training them to relieve themselves outdoors. That error is picking them up and carrying them outside to the designated place. They’re just so little and cute, it’s hard not to! But puppies don’t learn anything by this, and when they need to go, they will just wait for you to come and get them. Put your little darling on a leash and walk him or her outside–just like a big dog. That way your puppy will learn to come to the door and let you know when he or she wants to go out.